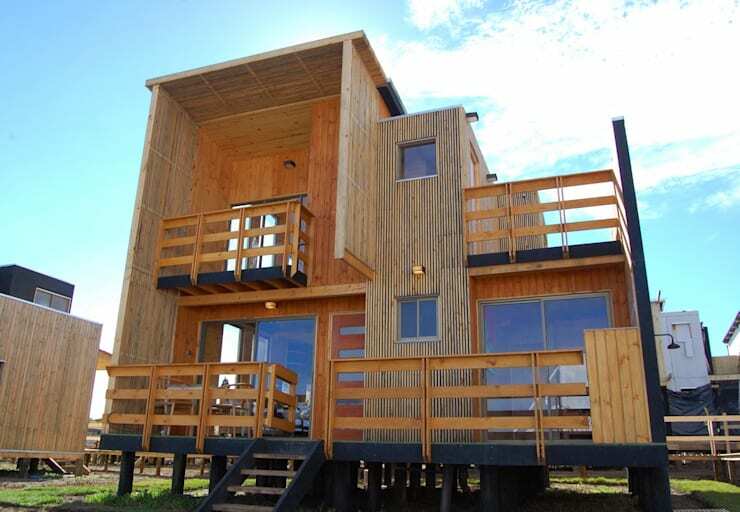 Wooden houses can be created in various structural formats. For example, lightweight wooden structures that make walls and roofs with thin planks, and heavy wood structures that fit thick woods together are typical examples. However, there is a common feature among the various types of wooden houses. This project is a wooden weekend house that will make you enjoy a holiday in a warm and natural environment. In addition, the sea view plays an important role in creating a resort feel to this place. No matter how cold it is, the moment you face the sea, you will be able to blow away all the fatigue and stress of everyday life. Let us have a look at this cozy wooden 2 floor house. The entrance of a house creates its first impression. A wooden house with a height of 2 floors has been raised on the foundation which raises the stage. A large opening is made on the outer wall near the entrance, creating a natural flow between the room and the terrace. This is a good arrangement because you can access the terraces from every room. 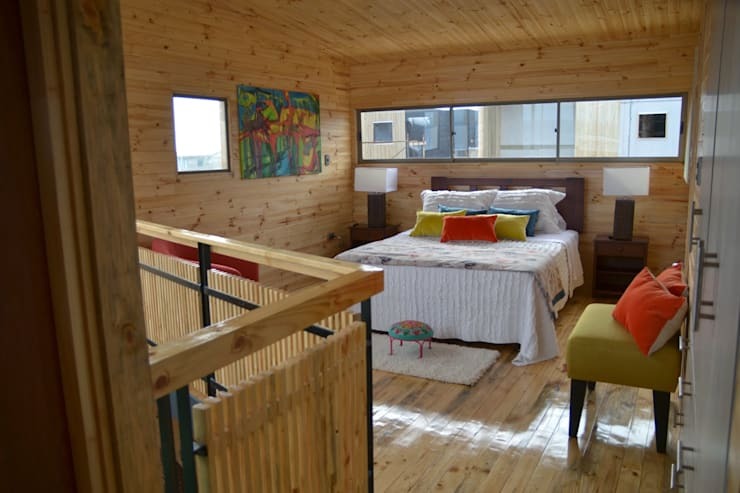 The exterior walls and handrails are all created from wood, which exudes a cozy and warm atmosphere. This amalgamation of a country style house and resort style house is outstanding. A pleasant indoor environment is a must for every home. The small windows on the side of the house and the long windows in the vertical form a beautiful appearance and allow natural light and air into the house. The openings in the front become a door with plenty of sunlight. The concise outside roof adds a sense of security, and wooden exterior walls with slightly different colors complete the colorful appearance. Let's take a step back and check the space outside. The wooden deck surrounding the building was designed with the railing installed to ensure user safety. While walking around the building, you can enjoy the scenery of the town or look at the sea. The extended roof that covers the porch is a useful space for avoiding rain or preparing for going out. It is a deck where you can relax around your home in a comfortable mood. The first thing that stands out in the interior is the kitchen, which is decorated in a modern style. In the kitchen, a counter top is installed and one side is used as a bar-style dining room. There is a lot of natural light in the kitchen, thanks to the big widnows, which also allows you to gaze at the scenery outside and forget any fatigue while you cook. It is a design that closely reflects the modern and bright life style of real users along with the kitchen designer. Here are 6 tips for redecorating your kitchen. Most of the interior space of the house is finished with wood, which gives a sense of nature. The living room of the house which is not so big, is decorated with colorful furniture and accessorized with even more colors. A red chair and a dark-colored table are eye-catching. The large window helps to flexibly use the living room and terrace on a case-by-case basis. For example, if the weather is good, you can open the door to open the atmosphere and close the door and use the living room independently when the weather is not that great. Here are 9 spectacular ideas to decorate your living room. In a house, the bedroom is the most cozy and comfortable space. It is the place where you start and finish the day, so a bedroom has to be comfortable in every sense. This 2 floor house, like any other space, has mostly wood in the bedroom. The bedroom is adorned with a variety of accessories similar to the living room, creating a colorful atmosphere. Also, because the bedroom is located on the second floor, it keeps a certain distance from the common area while using a large space. Here are 10 ideas to make your bedroom comfortably cozy. The living room of the house has the height of 2 floors and looks spacious and grand in terms of height. 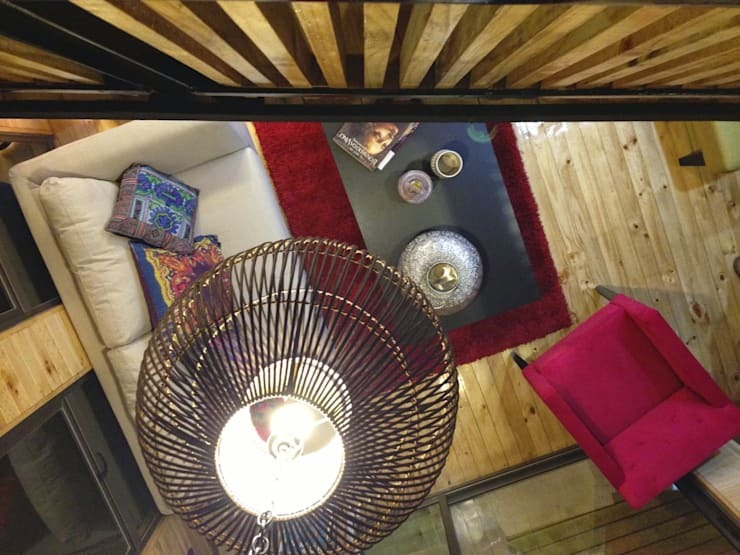 Looking down at the living room from the second floor bedroom, you can see elegant interior design ideas. The red carpet under the table adds a sophisticated feel to this colorfully designed room. The simple design of the lighting shows an elegant taste. Here are 6 ways to light up your living room in style. Finally, it is time to check the detailed layout of the house with the floor plan. 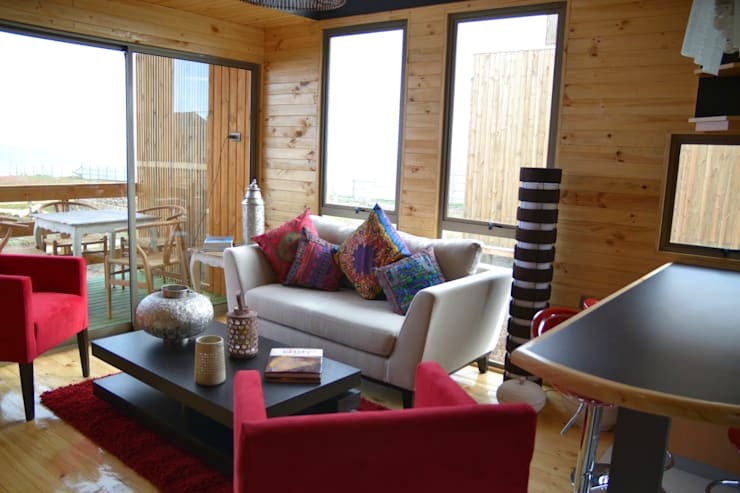 this house is a weekend house with three bedrooms, with a small living area. It is a good arrangement for the whole family to have a holiday or to invite friends and have a party all night. It will also be of great help to those who plan the building for accommodation or leasing purposes. So how about a wooden house where you can feel the breath of a tree? 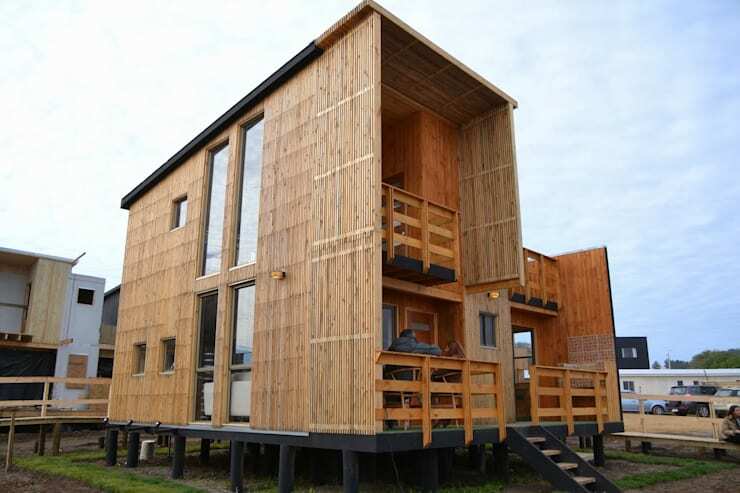 This article introduces seven wooden houses with natural ingredients and a warm atmosphere. 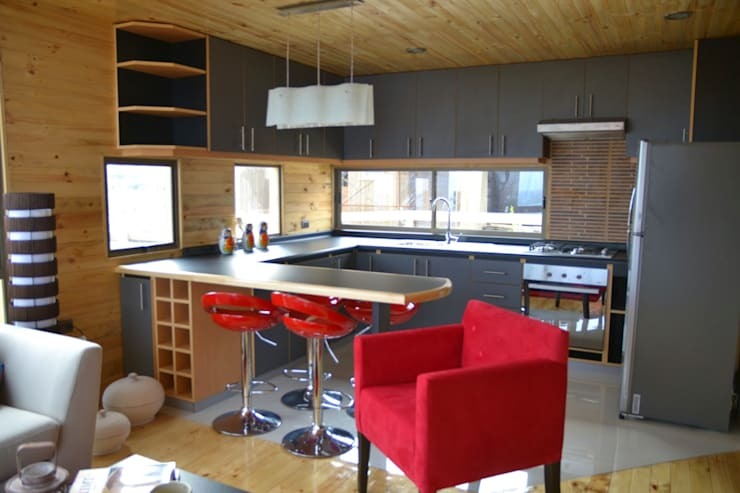 Of course, prefabricated houses that challenge low budget can also be suitable for weekend houses. 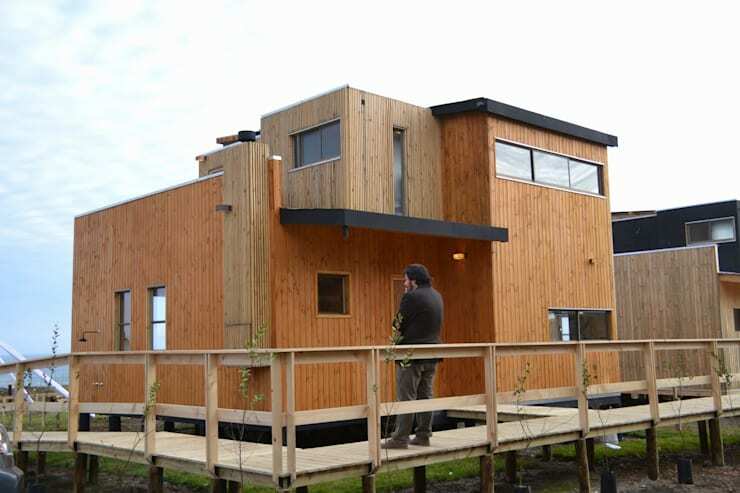 For example, a container house that deals with various information here would be a good alternative. See this wooden house, which is a celebration of rustic style. Did you like this wooden house? Let us know your thoughts.